If I Have a Mental Illness, Do I Have to Take Medication? Though on television and in the news mental illness is often treated as a shameful condition that produces “crazy” behavior, the truth is that mental illness is very common—and doesn’t necessarily mean you’re crazy! Research suggests that about 14% of Australians will develop an anxiety disorder each year, with 5% experiencing a major depressive episode. Mental illness doesn’t have to consume your life, even though it’s the third-leading cause of disability in Australia. Depression, anxiety disorders, and other mental illnesses are highly treatable. In fact, many people with mental illness wonder why they waited so long to seek treatment! But many are also concerned about the side effects of psychoactive drugs. You can treat your condition without medication, but you’ll need to develop a strong relationship with a provider you trust. At Three Seas, we can help you do just that. Better results; research consistently shows that therapy and medication together are the most effective treatment for mental illness. Faster results; even if you don’t want to take medication for the long-term, medication can offer you quick relief while you work through deeper issues in counselling. Better health; mental illness isn’t all in your head. It also undermines your physical health. By treating your symptoms now, you can improve your overall health, potentially contributing to a happier and more productive life. Feeling different; many people worry that medication will turn them into a zombie. While this is not a realistic worry, it’s still one that providers should treat with respect. Side effects; just like medications for physical conditions, mental illness medications often come with some side effects. The good news is that these side effects often fade after your body grows accustomed to the drug. 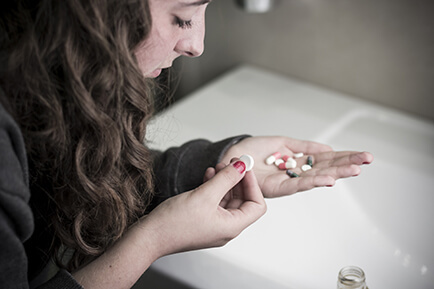 Not getting better; medication doesn’t work for everyone, and many of our clients find that they have to try several medications before they arrive at the right choice. To some people, this “medication merry-go-round” is a source of immense discouragement. Concerns about stigmatization. Some clients worry that taking mental illness medication means they’re “crazy.” Nothing could be further from the truth; you’re treating a medical condition that is not your fault. No one has to take medication, unless they’ve been ordered by a court to do so—and those situations are so rare that they might as well not happen at all. Ultimately, it’s up to you to choose whether or not you wish to take medication, and you should choose a provider who supports your choice—even if it’s not the choice he or she would make for themselves or a loved one. Sometimes, medication is the only option for getting better. If therapy hasn’t worked, your symptoms are getting rapidly worse, or your symptoms are so severe that they endanger your health and safety, medication could be your best option—and potentially even your only one. If you’re opposed to medication, give some thought to why this might be. Then consider whether a life filled with pain is really worse than taking medication. You may also want to contemplate your long-term future, since failure to take medication could land you in a mental hospital, costing you immense time and stress. Counselling, the single most effective weapon against mental illness. Lifestyle changes such as adopting a new hobby, establishing a regular schedule, or working to eliminate negative thoughts. Exercise; some research suggests that regular exercise can be as effective as some medications! Using nutritional supplements. Though research is mixed, some herbal therapies, such as St. John’s Wort, may prove effective in the fight against mental illness. Treating any underlying health conditions. At Three Seas, we offer comprehensive and personalized care. We’ll help you find the best treatment options for your needs, even if that means helping you uncover effective alternatives to psychoactive medications.